Sunday, April 21: Traffic control will be in place on both directions of SR 500, between Northeast 19th and Northeast 14th Avenues, from 1-3:30 p.m., for the annual Camas Easter Day Egg Hunt event. Maintenance on SR 14 both directions at milepost 12 near 6th Avenue. Right lane is closed, use caution, beginning at 8:56 am on April 25, 2019 until further notice. 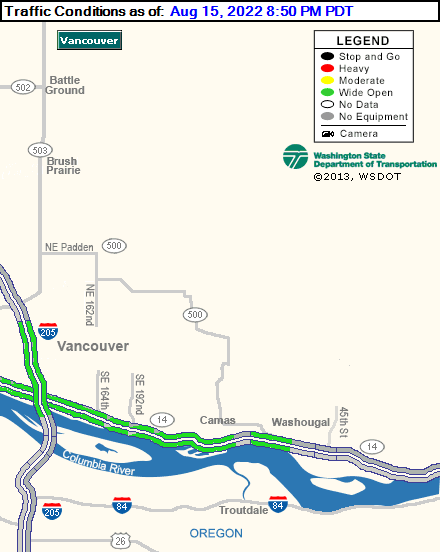 Monday, April 22 to Friday, April 26: Crews will perform right and left shoulder closures on the on-ramp to northbound I-205 from westbound SR 500 and Northeast Fourth Plain Boulevard daily from 7 a.m. to 5 p.m. for installation work.